The essence of art is not the imitation of nature, but the bringing into play, on pretext of imitation, of pure visual elements: measures, directions, ornaments, light, values, colours, materials, all distributed and organised in keeping with the injunctions of natural laws. In doing this, the artist is always dependent on nature, but instead of pettily imitating its accidents, he imitates its laws. … natural plastic manifestations: an eddy of air and water, the structures of shells or plants, etc., contain the finest measures of these exciting and reassuring elements… Thus, the art of drawing and painting, which depends on the art of feeling, draws its deep laws from morphology. In her encounter with nature, Sylvie Sarrazin retains and notes natural plastic manifestations such as eddies of air and water, reflected light, quivering water and wind. She takes inspiration from moments when the movements of matter – earth, water, air and light – become evident and convey a sensation of nature in a state of transformation and metamorphosis. 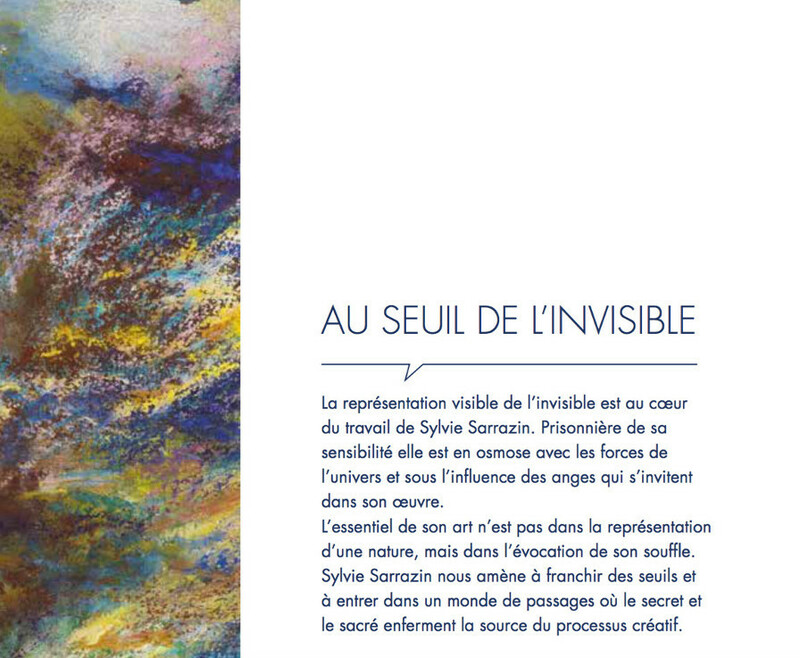 This creative principle of nature becomes the main challenge for Sarrazin’s painting. She captures tones and colours, identifies structures and writings between lines, dynamics and stasis. In her paintings natural elements and cultural signs, temperatures and temperaments follow and clash with each other, join and interlace together like a mappa mundi. From one canvas to the next, universes – microcosms and macrocosms – take shape and make perceptible the deep laws of morphology and the transformative forces of metamorphosis. In her “note-taking” and in her photographs, or her short videos, which she records when walking in the countryside, Sylvie Sarrazin captures, isolates and fixes motifs at the moment when they escape both obviousness and representation. It is in this space of semantic non-places that the beauty of line is revealed before drawing intervenes, and that of touch is felt before it becomes form, as is shade before colour. This is where her landscapes before the image are drawn and take shape. Inthe instant, in fragments and elementary forms, and from one canvas to another, all “becoming” seems written and frozen, as in a monad or a bud. Sarrazin’s canvases bear witness to a flux of time and materials, comparable to the Greek philosopher Heraclitus’s metaphor of the river: “We never step into the same river twice.” The water never ceases to flow on (to other banks?). As a union of opposing forces, becoming and fixedness (constancy) not only reflect a fundamental principle of knowledge, but oppose and complement each other in Sarrazin’s work. Beholders are induced to cross thresholds and enter a world of passages, of passages through matter: matrices, meshes, braids, traces and strata, layerings of time and matter. Opacities stand in contrast to transparency, reflections and vibrations. Thresholds and barrages stop us and at the same time invite us to cross them; they suggest the passage towards a beyond, where the secret and the sacred enclose the source of the creative process. Each painting contains a syntax in which the elements are structured and reversed. The gaze passes through the grids in the foreground and into the depths. Other elements and other writings form new strata, new screens and other depths that place the first planes and the depths of the painting at a distance. Background, middle and foreground, top and bottom all merge and separate to a rhythm that is now calm, now agitated, suggesting a sensitive nervous system in which – between polychrome and monochrome, hot and cold, vegetable and mineral, freeze and thaw – complementary poles strive for reconciliation or, on the contrary, polarisation. As in paintings by modern Romantics, time seems to take on the colour of the seasons and the temperatures and temperaments of the elements: fire, water, air and earth –although the artist does not actually imitate them. Horizontality and verticality endow the paintings with the quality of abstract landscapes in which points of view, perspectives, places and spaces are constantly being interchanged and reversed. Beholders find themselves on the inside of the exterior and on the outside of the interior; now they are in the matter and now rising above it thanks to changes of perspective. In these “Landscapes before the image” Sylvie Sarrazin becomes dependent on nature; instead of pettily imitating its accidents, she imitates its laws (A. Lhote). Like nature itself, the artist is constantly inventing. 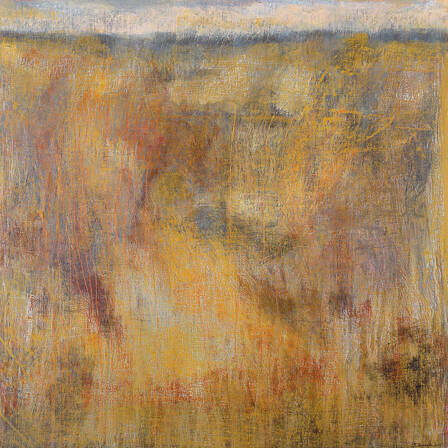 Each canvas is the fragment of a syntax and a law in which the sensible and the intelligible invite us on a journey whose place of arrival is called “creation, transformation.” In these “Landscapes” the different artistic genres – painting, engraving, drawing, relief – work together and intertwine. They compose complex scores in which all the elements are modulated, punctuated and transposed through minor and major scales, through intervals, through harmonic and/or dissonant chords that are simultaneous and successive, combining fugues and symphonies. It was not such an extreme thing for the moderns to do to heed the lesson of Africans and Polynesians, for primitive beings who live close to natural forms, who follow their rhythms, who physically feel their repercussions, spontaneously find the combinations of forms that are the most literally alive. The delegates of natural forces have much to teach the civilised. Sylvie Sarrazin is engaged in genuinely exploratory work on the sensible world of perceptions and sensations that she comes upon in nature. She spontaneously finds the combinations of forms that are the most literally alive, follows its forms, matches its rhythms, physically feels its repercussions, and makes us feel them through her painting. These natural forms, rhythms and writings are not only the graphic marks, writings, sounds and colours that she finds in nature; they are also engraved within us, as the inscriptions of time and memory, the matrices in which men have left the marks of their gestures and their exchanges with matter. Sylvie Sarrazin works both on matter and on man’s inscription in matter. Layer by layer, stage by stage, and trace by trace, she suggests the journey through those passages that lead us to the essence where the bonds between nature and culture are revealed and woven. As imprints, signs of time and its impact on matter, traces, signs, sounds and tones appear here, both rough and refined. They are inscribed in and organise the weave of time and matter. All the different components – traces of ideograms, of phonographs, of the first human writings, relics of ancient civilizations – fusion here, separate, and intertwine with traces of modern memory. As a “delegate of natural forces,” Sylvie Sarrazin traverses the history of modern painting: Monet’s Water Lilies, Twombly’s writing/mythologies, the colours/spaces of Rothko, his passages between matter and transcendence. As in the story of an invisible thread, bonds are woven between things and articulated where the primordial meets the contemporary, the ephemeral the eternal, emotions, matter. The inscriptions, the traces of time, the exchanges and the journeys, transform each painting into an epitaph housing the secret of the unknown masterpiece: the creative process itself.